Versatile musician, active in classical, contemporary composed and freely improvised music, harpist Milana Zarić combines orchestral and ensemble work with solo performance, connecting the classical idiom to contemporary sensibility and new technologies. Organizer as well as performer in collaborative projects, she aims to create new bridges and challenge the boundaries between the traditional roles of composer, performer and improviser. 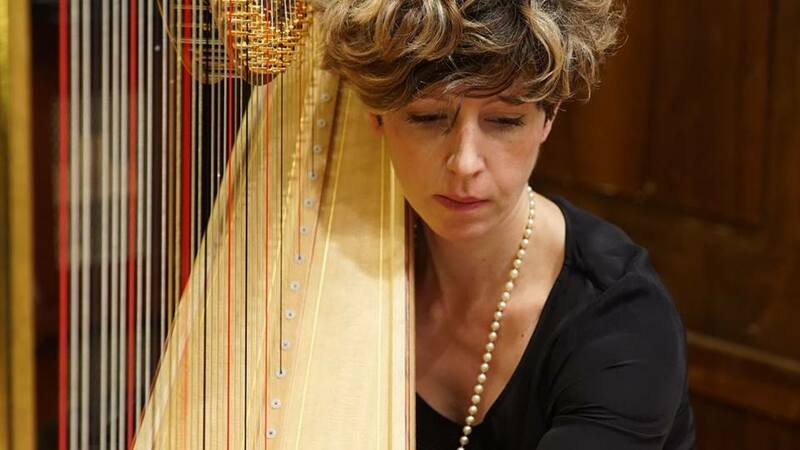 Milana Zarić has been principal harpist at the Belgrade Philharmonic Orchestra since 2005, performing regularly under top international conductors and soloists. The orchestra has toured the United States, including Carnegie Hall in NYC, as well as Switzerland, Germany, Sweden, Italy, Austria, Oman and ex-Yugoslavian countries. In April 2014, Milana has appeared as soloist with the BPO in Belgrade. Milana is active as a soloist and chamber musician, having been the founding member of several chamber groups based in Serbia and Holland, such as Trio Timbre (flute, viola and harp) and Ensemble Echoes (plucked string instruments and percussion). She has regularly performed in a variety of chamber ensembles, such as Atlas Ensemble in Amsterdam, Ensemble Metamorphosis in Belgrade, Žebeljan Ensemble. Since 2010, Milana has commissioned new solo harp works from composers James Erber, Richard Barrett, Hugo Morales Murguia, Falk Huebner, Teodora Stepančić and Ana Gnjatović. The piece tendril, for harp and electronics, written for her by Richard Barrett, has so far been performed in duet with Richard, in Belgrade, Zagreb, Melbourne, Singapore, London, New York City, Minnesota, Los Angeles and Birmingham, UK. From 2009 to 2011, Milana was doing research in contemporary music for harp and improvisation, at the Royal Conservatoire in The Hague. Upon her return to Belgrade, she formed, together with trumpet player Nenad Marković, a contemporary music collective and ensemble Studio6. The ensemble project highlights include a performance of Heiner Goebbels’ Songs of wars I have seen in Belgrade in 2013, conceptual project Intimate rituals, combining original music by Eastern European maverick composers Ernö Király and Horațiu Rădulescu, as well as electro acoustic work for 6 players in 6 parts close up, by Richard Barrett. Studio 6 has collaborated with many leading Serbian composers, instrumentalists, sound artists, visual artists, improvisers Agusti Fernandez, Vinko Globokar, Ensembles proton and Phoenix Basel, and have recently toured the UK. Milana is also the principal harpist of No borders orchestra (NBO), young and upcoming symphony orchestra consisting of musicians from all the republics of ex-Yugoslavia. NBO’s debut CD ‘Opening’, has been released by Deutsche Grammophon in 2015. Being actively involved in education projects, Milana is also giving harp workshops and masterclasses for students, composers and improvisers. She was a guest lecturer at Cal Arts in Los Angeles, Herb Alpert School of Music in Minneapolis, Birmingham Conservatoire, Guildhall School for Music and Drama in London and Singapore. She is also a successful harp teacher, whose students have won numerous prizes at international competitions. Milana collaborates regularly with composers and has given first performances of many works (solo and ensemble). As one of the major Serbian proponents of modern and contemporary music, Milana has given Serbian premieres of solo and ensemble pieces from composers as diverse as S.Bussotti, K.Saariaho, F. Donatoni, J. Cage, S. Steen-Andersen, T.Rai, R. Murray Schafer, K. Stockhausen and C. Wolff. Through her artistic leadership of Ensemble Studio6, as well as her activities as soloist, she has encouraged, commissioned and performed works by Serbian composers Svetlana Maraš, Sonja Mutić, Jasna Veličković, Nemanja Radivojević, Vladan Kulišić, Branka Popović, Svetozar Nešić, Isidora Žebeljan and many others. Apart from her involvement in contemporary composed music, she is an active free improviser, often in various groups or in a duet with Richard Barrett. Improvisers with whom she has worked with include Agusti Fernandez, Chris Cutler, Paul Pignon, Annie Gosfield, Butch Morris, Rhodri Davies, Yedo Gibson, Anne la Berge, Zsolt Sőrés, Peter van Bergen, Peter Evans. She was one of the founders of Collective for improvised music ImprovE2, organisers of regular monthly events in Belgrade between 2012 and 2015, with over a hundred musicians and sound artists involved. Milana’s festival appearances include Culturescapes Basel, November Music, Den Bosch, Rotterdam Operadagen, BEAM festival, London, Music Biennale Zagreb, BEMUS, BITEF, Ring Ring and International review of composers in Belgrade, Richard Barrett@Spectrum festival in New York City, as well as Audiograft festival in Oxford, UK. Milana holds degrees from University of Arts in Belgrade (Bachelor studies in 2000); Trinity College of Music, London (Postgraduate Advanced Diploma in 2002, with Gabriella dall’Olio, Imogen Barford and Sioned Williams ); and Royal Conservatoire in The Hague, Netherlands with Ernestine Stoop (Master of music in 2011).